A Mobile Ad hoc NETwork (MANET) is a collection of wireless mobile nodes forming a network without using any existing infrastructure. All mobile nodes function as mobile routers that discover and maintain routes to other mobile nodes of the network and therefore, can be connected dynamically in an arbitrary manner. The mobility attribute of MANETs is a very significant one. The mobile nodes may follow different mobility patterns that may affect connectivity, and in turn protocol mechanisms and performance. 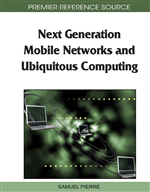 Mobility prediction may positively affect the service-oriented aspects as well as the application-oriented aspects of ad hoc networking. At the network level, accurate node mobility prediction may be critical to tasks such as call admission control, reservation of network resources, pre-configuration of services and QoS provisioning. At the application level, user mobility prediction in combination with user’s profile may provide the user with enhanced location-based wireless services, such as route guidance, local traffic information and on-line advertising. In this chapter we present the most important mobility prediction schemes for MANETs in the literature, focusing on their main design principles and characteristics. Wireless mobile networks can be classified as infrastructure-based networks and ad hoc networks. The former type includes networks with fixed base stations and each mobile node connects to the network by communicating with a base station which is within its communication range. A Mobile Ad hoc NETwork (MANET) is a collection of wireless mobile nodes forming a network without using any existing infrastructure. All mobile nodes function as mobile routers that discover and maintain routes to other mobile nodes of the network and therefore, can be connected dynamically in an arbitrary manner. Therefore, a MANET is self-organized i.e., it is deployed and managed independently of any preexisting infrastructure, while it autonomously determines its own configuration parameters such as position identification, power control, routing and addressing.